I can't get my family's Sunday morning cinnamon rolls started just yet. Today's morning paper will have to sit on the counter until this is posted. I know we need juice and applesauce from the store, but our Target run will have to wait. 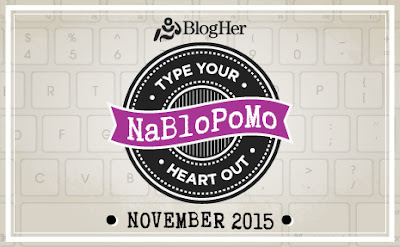 Everyone who lives with me knows it's November 1 and that's the same thing as saying NaBloPoMo. NaBloPoMo for everyone! I know it sounds like a tasty hummus treat and it kind of is at that. NaBloPoMo stands for National Blog Posting Month, where bloggers post on their blogs every day for the month of November. So whether it's a kick start you need to getting creative juices flowing or seeking out new people to meet, you'll find both while breathing life back into a possibly neglected writing space. Start today and join up. BlogHer November writing prompts are here. I'm all in: writing every day reminds me of how lucky I am and how much I love having my own place to publish my words. Just look at that, my first NaBloPoMo post for 2015. All right, kids, here I come, but before you get your cinnamon rolls, say nablopomo for me. Hi, Joann: thanks for stopping by. The prompts are a lot of fun and really get the creative juices going, it's wonderful to see what our minds come up with. We all have so many fantastic stories to share. I understand, Amanda. What I love the most about nablopomo, and the reason I do it, is that when you have nothing to write about, the gold comes to the surface. It's like having to come up with something when you think the cupboards are bare... it's exciting how much is forgotten and dormant when there are louder easier pieces that float to the surface first. I'm ready and I hope the family is too. This is my first time participating, YAY! And yum, now I'm totally craving cinnamon rolls!!! I love you for truly introducing me forever ago to this event. And I look forward to connecting with you daily. ♡ Now, Cinnamon rolls. Mmmn. Yum. I do it every year. I've been trying to prep the family again this year, but it never works LOL. You do what you're able to do, that's what I like, the challenge is daily posting but if it only works out to be 3 time a week but that's an up from your usual then that is success! I don't do it because I can't get the acronym right. Plus weekends. I don't do weekends. Sigh my life is so hard.